Our Mission: To protect & preserve the magic of Elizabeth Street Garden as a public community green space and to determine how NYC Parks & Recreation together with the community can protect this space for generations to enjoy. ESG has established a strong legal team with Norman Siegel and Kate fletcher to stop the developers from destroying the garden. Can't get enough of the Magic of Elizabeth Street Garden? Want to help ESG protect and preserve this beloved community green space? Click the button to sign up! CLICK HERE TO READ ABOUT OUR FUTURE PLANS! UPDATE: A Developer is chosen but THE FIGHT IS NOT OVER. We will continue to pursue all options including Elizabeth Street Garden’s (ESG) legal action. We urge the public not to be deceived by the fancy developer renderings and to see the truth of the matter; that the administration, the Mayor and Councilmember Margaret Chin have continuously ignored our Community’s outcry. They have ignored the thousands of letters and signatures in support of protecting & preserving the Garden in its entirety, they have ignored CB2’s 4 resolutions, and they have ignored a true win-win outcome - where they could build more affordable housing on the alternative sites provided by our community. The bottom line is that the destruction of Elizabeth Street Garden will be absolutely devastating to this neighborhood and our community. No matter how the City sugar coats their plans, they are yet again, taking away a public community treasure. 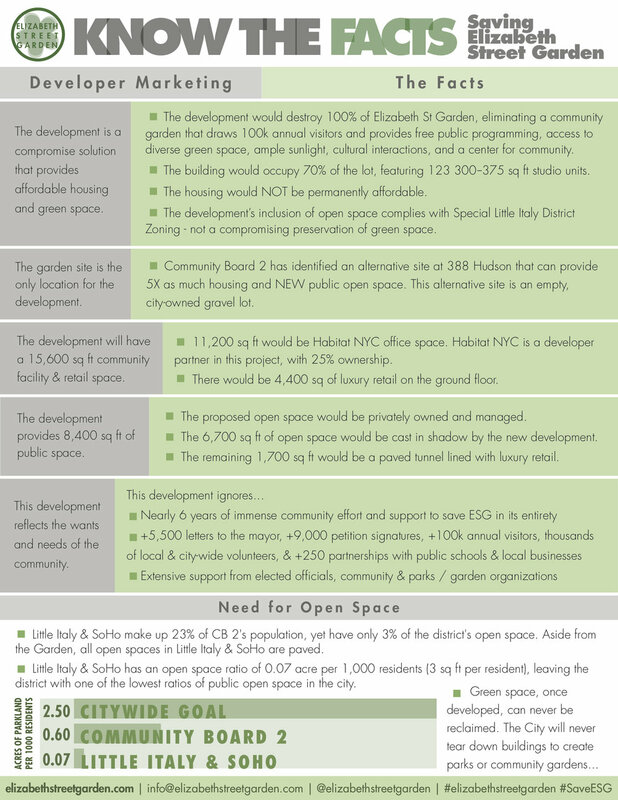 From the beginning, the City’s process of designating the Garden as a site for affordable housing was not transparent. With the community identifying alternative sites, we do not need to pit affordable housing and real public green space against one another. Donate now to help us protect and preserve the Garden we love. All proceeds donated to ESG go directly towards Our Legal defense fund, pr, and garden maintenance & operations. The time is now. The Garden is not yet saved! Consider making a tax-deductible donation towards funding our legal defense fund, PR, garden maintenance & operations, and running free programming for the community! Weekdays: Noon - 5 p.m., Weekends: 10 - 5 p.m.
Support locally this #GivingTuesday by donating to #ElizabethStreetGarden any time on Tuesday, November 27. LINK IN BIO. Elizabeth Street Garden is a volunteer run nonprofit. All donations are tax-deductible..**Please be sure to use the correct website**: elizabethstreetgarden.COM/donate —————— ESG together with attorney Norman Siegel is leading the legal effort to #SaveESG Please consider donating to Elizabeth Street Garden (ESG) this #GivingTuesday 11/27. Elizabeth Street Garden (ESG) is an independent, community lead, 501(c)(3) non-for-profit organization. We are committed to exploring every option available to preserve and protect the Garden and save our much needed Community green space in Little Italy. United by the desire to change the way we save the garden, former members of the Garden’s previous organization, active garden volunteers, and advocates for community gardens came together and formed ESG.